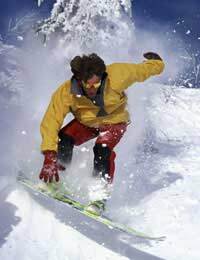 Snowboarding is a popular winter sport and available in most ski holiday resorts. According to people who enjoy it, snowboarding is actually easier than skiing, but if it’s your first experience of a board, you’ll need to be prepared to spend a lot of time falling over, as the few days of learning to snowboard can be pretty difficult, even if you’re an experienced skier. Well padded snow gear is a must! It’s a good idea to start off by renting your snowboarding equipment so that you can decide whether it’s really your thing – and if you are any good at it. A good rental outlet will be able to advise you about the best type of board for you, as there are several factors which have to be taken into account when choosing a board, such as your skill level, weight and foot size. There are also different types of board for different type of snow...so it pays to ask an expert. Short boards: are easier to manoeuvre so are a good choice for beginners. Just because you can ski, it doesn’t mean you will be able to snowboard, so if you plan to try the sport on holiday it’s wise to have lessons before you try and go it alone. The body tension and movements are completely different from skiing, and you will need to learn how to adjust. The most common snowboarding injuries are wrist sprains and fractures, bruises, dislocation of the elbow and shoulder and neck injuries. It’s a good idea to equip yourself with wrist protectors and knee pads, especially if you’re new to the sport. And always wear a good helmet and protective, UV resistant sunglasses to avoid snow blindness. The fixed stance in snowboarding (regular or ‘goofy’) will probably take you some time to get used to and you’ll need a decent sense of balance to get on well in snowboarding. It’s easier to find your position, as you only have to keep your feet fixed to the board, unlike in skiing where you have to also work out how to keep your skis together, while keeping your knees bent, which makes it sound simpler, but does mean when you are not moving you'll probably be sitting in the snow, having fallen over! You'll also need to learn how to get in and out of the chair lift with a snowboard stuck to your feet! This move can result in some hilarity...and falling over. Again. Keep going! The first few days of a snowboarding holiday can feel like a hard slog, with plenty of time on your backside in the snow while to try to get to grips with how to stop, control speed and handle turns. Once you have learned the basic techniques though, it gets easier to move from beginner to intermediate, and after you master the basics, you’ll love the feeling of floating over the snow that snowboarding gives you. Don’t try to take on more difficult runs than you can manage. Stay aware of other skiers and boarders – for your safety and theirs. Make sure your equipment is in good condition and keep checking it.